Governor Rick Perry honored 32 police officers, firefighters and medical personnel, who were killed or seriously injured in the line of duty at the Capitol in Austin today, awarding each officer with the Star of Texas Award. Six of those first responders awarded, were in Bell County. Killeen Police Officer Robert “Bobby” Hornsby, Killeen Detective Charles “Chuck” Dinwiddie and Bell County Deputy Adam Davis, who were killed in the line of duty, were honored posthumously. Killeen Police Officers Juan Obregon and Odis Denton and Temple Police Sergeant James Bennett, who were seriously injured in the line of duty, also received the Star of Texas Award. This year marks the 11th anniversary of the legislation creating the Star of Texas Award, which was established to honor and commemorate the bravery and selflessness of Texas’ first responders. 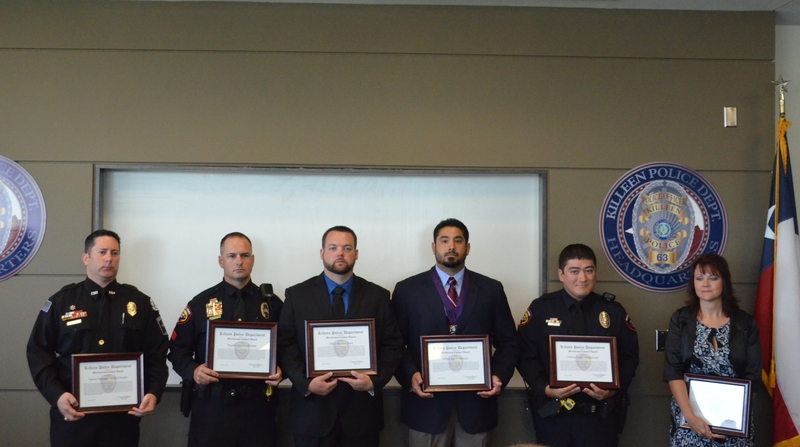 Killeen Police Department recognizes and awards eight officers for their courageous actions. The Killeen Police Department responded to the Grandon Apartments on Saturday, July 13, 2013, in reference to a man with a long rifle threatening residents in the pool area. As the situation unfolded, these officers immediately took action demonstrating courage, risk and danger to his/her personal safety. Chief Dennis Baldwin presented the awards on Thursday, July 24, 2014 to the following officers; the Medal of Valor to former Officer Christopher Ache and Officer Odis Denton; the Police Purple Heart and the Meritorious Conduct Award to Officer Juan Obregon and the Meritorious Conduct Award to Sgt. Jonathan Rinehart, officers’ Brandon Smith, Joseph Delongchamps, former officer Lorraine McAtee and Tactical Paramedic Michael Neujahr.